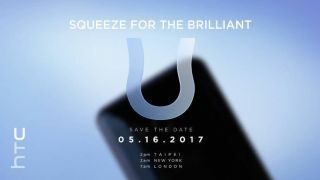 We thought the long-running saga of the name of HTC's 2017 flagship phone had been settled earlier this week, when the company sent out invites for a press event for the HTC U, due to be held on May 16. Definitely the HTC U and not the HTC 11 then? Well, apparently there's another twist in the tale. VentureBeat reports that the phone will be branded the HTC U 11, borrowing from both this year's naming scheme and flagship HTC phones of the past. The tip is from phone-spec-leaker-in-chief Evan Blass, which is just about as good an unofficial source as you can get. The idea behind the name is to position the phone as both a successor to the HTC 10 and part of the new U family of phones the company has pushed out this year... so we hope that's cleared everything up for you. The colors for the new handset were leaked out in the same report: white, black, blue, red, and silver are the hues that HTC has gone for, though not all of those paint jobs are going to be available in all regions, so don't get your heart set on one yet. Whatever the phone ends up being called, it looks like being a flagship worth waiting for - the 5.5-inch device is going to come with touch-sensitive, squeezable edges that can be used to scroll and select without any fingers obscuring the screen. The phone is also up against some stiff competition this year, with the LG G6, Samsung Galaxy S8, and S8 Plus already unveiled, and more phones from Google and Apple on the way in a few short months. We'll bring you news of what HTC is offering from the launch event next month.